Changing the way you travel! 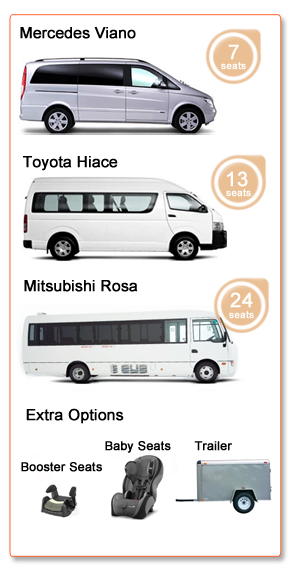 Book Online today and travel in Style & Comfort or get in touch with us. Millions of people arrive in Melbourne every year from different cities and countries all over the world, therefore it is important that we deliver in excellent chauffeur driven limousines and buses. As this is was voted the most livable city in the world, a whole lot of opportunities are presented to our visitors as they get to wine and dine in our restaurants, visit the beach and markets, shop, go on sightseeing tours, travel to museums and national parks, among many other activities. Sky Vans is here to help you have a pleasant travel experience around Melbourne with our chauffeur driven means of transport. Whether you are a local, tourist or an international or domestic business executive we strive to provide you with first class transfers. Our company understands that some travelers may bring along their young babies. To cater for these type of travellers and families, we provide airport transfers with baby seats. The transfers are done by using top-of-the-range vehicles that focus on the provision of safe transfer services for everyone on board. Our Melbourne airport transfers with our minibus and other vehicles service every part of the city. Therefore, business people have no reason to worry about finding personalised transportation from airports to their preferred destination. It is worth mentioning that the chauffeurs working for our company speak multiple languages, thus ensuring that communication between them and the travelers from all over the world is clear and legible. This makes us an outstanding company that puts the needs of our customers first. We can provide you transport from the Melbourne airport to city hotels at any time, or vice versa, or anywhere! Contact and book with us today!